This first birthday, inspired by a quaint French cafe, was spotted on Spearmint Baby (originally posted on Pink Peach Cakes). 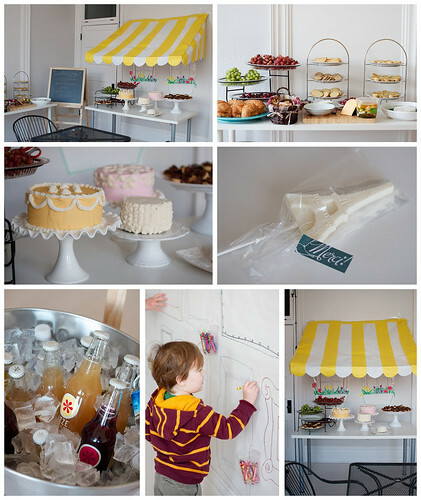 I love the yellow and white striped awning, cheese & crackers, white chocolate Eiffel tower pops and cakes. Perhaps my favorite part, though, is the wall covered in paper with ornate frames drawn in marker for the children to create their own masterpiece within! How adorable!